US aerospace giant Boeing has unveiled concepts for systems that could be used as the key components of a deep space manned exploration mission. At the heart of the plans is a system known as the Deep Space Gateway, a crewed spaceport that would be used as a staging post to launch manned missions to the moon and Mars. 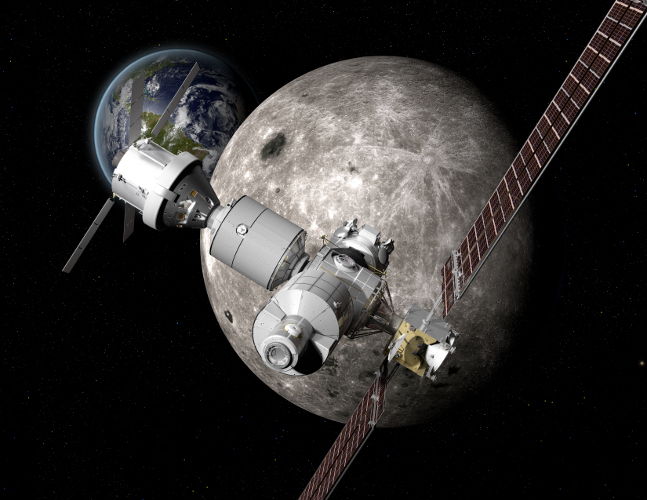 Boeing claims that the Gateway could be delivered to cislunar space (the space between Earth and the moon) by NASA’s Space Launch System (SLS) which Boeing is currently helping to developed. Pete McGrath, director of global sales and marketing for Boeing’s space exploration division said that the gateway could be assembled in four launches within the next 10 years. Powered by a Solar Electric Propulsion (SEP) system the gateway is expected to use a docking system similar to that used by the International Space Station for commercial operations. Under Boeing’s plans, the gateway would host the so-called Deep Space Transport vehicle, which would take humans to Mars. Also powered by a solar electric propulsion system, this vehicle would be equipped with a habitat specifically designed to protect passengers from deep space’s harsh environment. It’s envisaged that once near Mars crews could deploy a lander for surface missions or conduct other scientific and robotic missions in orbit. The gateway and transport systems are being developed as part of NASA’s Next Space Technologies for Exploration Technologies (Next Step) program and an ongoing High Power SEP technology development effort within the agency. Nice concept, but as I understand it, we know LESS about 90% of our own deep oceans than the surface of our nearest neighbour, our moon. Something wrong with the thinking here? This is getting closer to a better option. What is needed is a very large deep space station/ ship in permanent solar orbit to explore the solar system. It could conduct rescue ops, offer a real shelter against radiation. Would last centuries. Many other benefits. It would be an international effort.